Picking a high quality protein shake can deliver a tremendous muscle-building boost for serious athletes and bodybuilders like you. If you are looking for an equally serious protein supplement for your active lifestyle, better choose Powerbar 92% Protein Plus! 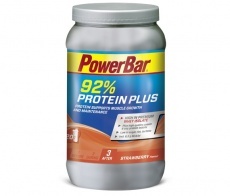 Powerbar 92% Protein Plus heeds your call for a multi-source protein shake that tastes great, mixes easily, and delivers massive amounts of premium protein. Each serving supplies your body with 26.1 grams of protein (whey protein isolate, calcium caseinate, soy protein isolate) that will keep your muscles on a steady growth and rebuilding mode. The proteins found in this supplement have complete amino acid profiles, which means that you get all the EAAs (Essential Amino Acids) and the BCAAs (Branched Chain Amino Acids) that will promote lean muscle development and regeneration. The best thing about Powerbar 92% Protein Plus is that each serving contains less than 1 gram of fat and carbs – ensuring that your body packs on popunds of lean muscle and not unwanted fat reserves!This protein shake is also suitable for vegetarians who need a reliable source of protein to support an active lifestyle. Build high quality muscles by loading up on premium protein... go with Powerbar 92% Protein Plus! Have a question about 92% Protein Plus? What is it, what does it do, how and when to use or something else? Ask us. “92% Protein Plus 600 grams” is currently out of stock. Enter your details below and we will let you know when it's back in stock. ALLERGEN INFORMATION: May contain traces of gluten, egg, nuts. Mix a 30g serving (approx. 3 tablespoons) with 300ml water. Drink immediately after sport. WARNINGS 92% Protein Plus : Food supplements should not be used as a substitute for a varied and balanced diet and healthy lifestyle. All PowerBar products are shown in the Cologne List®, and as a result we can offer athletes even more security and trust. The Cologne List® publishes products that are tested for prohibited substances (anabolic steroids and stimulants) in a laboratory that specialises in this field, and is recognised worldwide. Keep out of reach of children.